Want to see our September 11th news conference on livestream? Fundraising Goal for 9/11 Activities Reached! Sept. 11 Bobby McIlvaine Act News Conference in D.C.
Friends, you did it! On Wednesday, we reached our fundraising goal of $10,000, which will enable us to cover the costs of our September 11th anniversary events as well as produce a first-rate video to be released alongside Dr. Leroy Hulsey’s draft report on WTC 7 later this fall. Given this outpouring of support, we’ve decided to aim even higher and try to bring you a livestream of our September 11th news conference at the National Press Club, where we will launch the national campaign for the Bobby McIlvaine Act. The National Press Club requires the use of its in-house livestream service, which costs $2,850. Please help us raise this amount today so that we can expand the size of our audience exponentially. Not only will it allow thousands of supportive citizens to watch LIVE, it will also make the event accessible to journalists across the country who aren’t able to come to the National Press Club. Initially, we considered the cost of the Press Club’s livestream to be beyond our reach. But because of the swell of support this past week, we now know it’s attainable. Help us increase the reach and profile of the Bobby McIlvaine Act announcement by donating today! The Plan for Next Week! Wednesday, September 6, 2017, at 8:00 PM Eastern: Dr. Leroy Hulsey, speaking from the University of Alaska Fairbanks’ Schaibel Auditorium, will present the findings and conclusions detailed in his team’s September 2017 Progress Report, which will be issued the same day. The University of Alaska Fairbanks’ webstream site is momentarily down, but more info can be found in UAF’s event post. Friday, September 8, 2017, at 6:30 PM Eastern: Richard Gage will be speaking and screening our newest documentary, Stand for the Truth, at the event “From 9/11 Truth to 9/11 Justice” at New York City’s Foley Square. 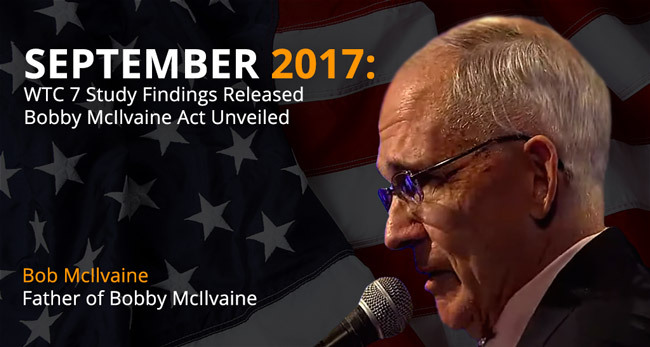 Monday, September 11, 2017 at 1:00 PM Eastern: Bob McIlvaine, Peter Ketcham, and Richard Gage will announce the “Bobby McIlvaine World Trade Center Investigation Act” at the National Press Club in Washington, D.C. Later that day and the following day, we will hand-deliver the Bobby McIlvaine package to all 535 members of Congress. Visit the Press Club’s website for more info. Monday, September 11, 2017 at 7:00 PM Eastern: Richard Gage and Peter Michael Ketcham will be participating in the “9/11 Truth Seekers Panel” at the Holiday Inn Rossyln Key Bridge near Washington, D.C.
Monday, September 11, 2017 from 3:00 PM to 10:00 Pacific: AE911Truth’s latest documentary, Stand for the Truth, will be screened at the “9/11 Truth Film Festival: Why 9/11 Truth Still Matters” in Oakland, CA. Those of you near Washington, D.C., and those traveling greater distances to commemorate 9/11 are invited to attend our news conference and join us on Capitol Hill. To RSVP for the news conference or volunteer for our Capitol Hill outreach (or both), please email us at Congress@AE911Truth.org. 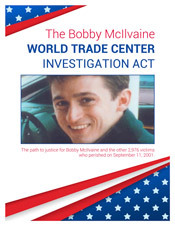 We need to assemble a group of at least 15 volunteers to hand-deliver the Bobby McIlvaine package to all 535 members of Congress on September 11th and 12th. If you contact us soon enough, we will even assist you in scheduling a meeting with your congressperson!